Baju raya hunt going nowhere? Check out Melinda Looi’s Raya 2016 ocean-inspired collection in collaboration with Sazzy Falak and swoon. Melinda Looi’s collection for Raya 2016 is out and if you’re a fan of hers, like I am, then you must check out her new Eid-worthy pieces. Rendered and inspired by the colors of the sea, Emel by Melinda Looi x CLPTS is created with lovers of colors and prints in mind. Color-blockers will swoon along with the print-mix loving crowd and the ones that go gaga for charming embroidered lace will be utterly spoiled for choice. Melinda Looi collaborates with Sazzy Falak, Atilia Haron, Dynas Mokhtar, Serena C. Aishah Sinclair and Daphne Iking this time around with a collection of modern baju kurung that is sure to keep heads turning. With the use of blue ocean-inspired motif that leans on the abstract side, fresh eye-popping colors and detailing like mesh and lace, Melinda Looi’s Raya 2016 collection is visually captivating. Though I have love for muted hues, I’m quite smitten with the modern kurung selection that’s designed with Sazzy Falak’s style in mind. I might be biased because I love me some Sazzy but I’ll let you decide if the styles of baju kurung modern she’s wearing are your cup of tea as they are mine. I love the cinched-at-the waist peplum blouse and the mermaid style skirt that keeps the silhouette long and also put-together. If you’re petite just like Sazzy, you definitely can wear this collection, for sure. This comes with a waist-cinching belt, demure lace sleeves and a peplum lace underlay. The round high neckline is a fresh spin on a traditional baju kurung top which I quite love very much. This ocean-inspired patterned kurung is a beauty. I just cannot get over the abstract splashes of blue hues that kind of tie-dye-esque. An edgy baju kurung for sure! This colorful baju kurung iteration is awesomely eye-catching. The long mermaid skirt in black makes a quiet backdrop for the bokeh-like patterns on top to pop. A mesmerizing piece to call your own, most definitely. Those who have strong love for pinks will want this in their Raya go-to party staple. Soft pink and sweet lace together – Who’d say no, right? 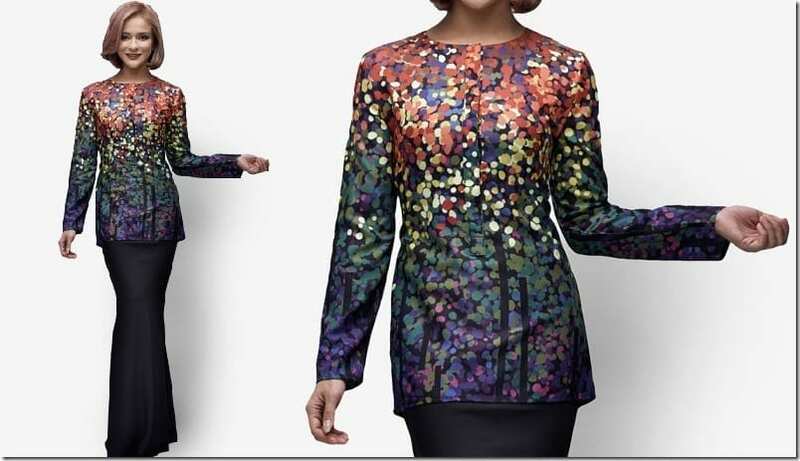 This baju kurung is rendered in abstract patterns and a mix of colors that are sophisticatedly subtle. This one has a round high neckline and a red patterned long skirt that is straight cut in shape keeping with the more traditional baju kurung skirt style. Another version of the same modern kurung as the above but in gorgeous green. This one’s for the lovers of clean no-color party garb. It’s chic in that kind of recognizable modern way, a perfect choice for the minimalist dresser. What are your thoughts on Melinda Looi’s latest Raya 2016 collection? Will you be wearing her modern kurung pieces? Share below – I’d love to know.